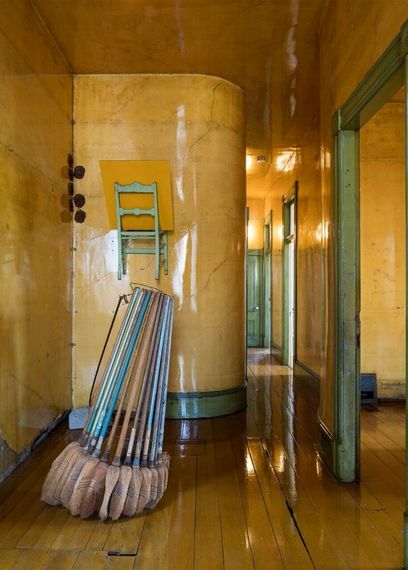 Back in 1975, when artist David Ireland bought an 1886 Edwardian-Italianate row house in San Francisco's Mission District from an accordion maker named P. Greub, the place was a mess. Greub, clearly a hoarder of sorts, left behind old brooms and jars and broken chairs and a bunch of other stuff that Ireland chose not to toss, since possibility inheres in everything to an artist. But that wallpaper had to go. Ireland spent the next three years stripping and buffing the walls down to the plaster, then covering them with a polyurethane paint that gave each room a golden glow, especially when lit by the moving sun or, of an evening in the living room, by the two gas torches dangling from copper wires above the sitting area. The walls still showed every crack and stain and gouge, though: intentional signs of the house's lived history, as opposed to the moment in time when Ireland inhabited it. In other words, Ireland made his home a work of art, one reflecting his distinct (to say the least) sensibility. Tiny plaques commemorated the damage left by the safe Ireland dropped a couple of times hauling it downstairs for Mr. Greub, whose name and trade stayed on a front window. When an upstairs window shattered, Ireland covered it with copper plate normally used for etching, then tape-recorded what you could see out the window if you could see out the window ("two trees, three-story apartment house...Saint Charles church, Bank of America, yellow house with gray roof...."). The tape deck sat on a table below the window, next to one of Ireland's signature cement "dumbballs." Grouped in a tilted circle from most worn to least, the ancient brooms turned into "Broom Collection with Boom." The broken wood chairs became a decorative theme, so to speak: hung from a wall; displayed in an alcove like an historic three-legged throne; beside Ireland's bed, the chair's missing back replaced with a bound San Francisco Chronicle circa 1976. Of course Ireland had a real bed, and some comfortable chairs, and homemade, cement-base floor lamps you could read by, a desk and display cabinet and dining room table around which sat friends who came to dinner. Ah, to be one of David Ireland's dinner guests. You could spend days just exploring the decorative items in the dining room. And imagine the conversation. Age and health issues forced Ireland to leave the house in 2005, and three years later, it was mere days from being sold at auction, no doubt to be replaced with condos, maybe retail on the ground floor. 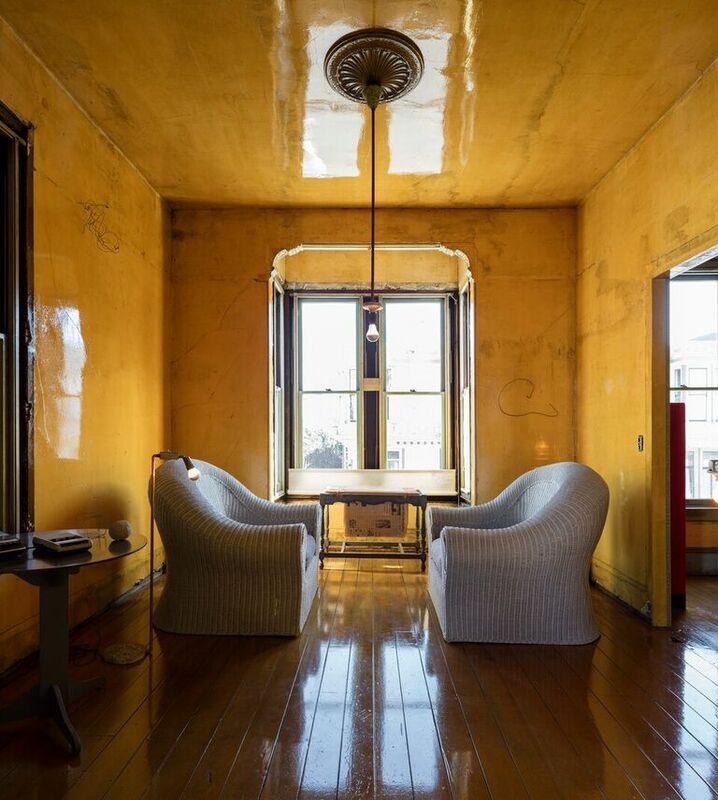 But cooler heads prevailed on Carlie Wilmans, a philanthropist and arts patron, who toured the house at 500 Capp Street and then bought it, with the intent to restore it and open it for tours and exhibitions, with an education center on a newly stable lower level. Now, at the end of an engaging ninety-minute tour, we all can sit at that dining room table (if not in the other rooms), enjoying Ireland's quirky sense of art is life is art...is life.... Open to the public since January, the David Ireland House will feature rotating exhibitions of the 3,000 pieces Ireland created, special programs, and who knows what. Check the web site for upcoming tours, exhibitions, and events. This is one home tour you don't want to miss. 500 Capp Street Foundation, 415.986.1571, 500cappstreet.org.